I was very disappointed when the Arbour Room at Rutherford House closed down 5 years ago due to financial difficulties and the chef's unexpected resignation. It was one of the only venues for afternoon tea in Edmonton and the scones were a unique recipe that was among the best I've tasted. 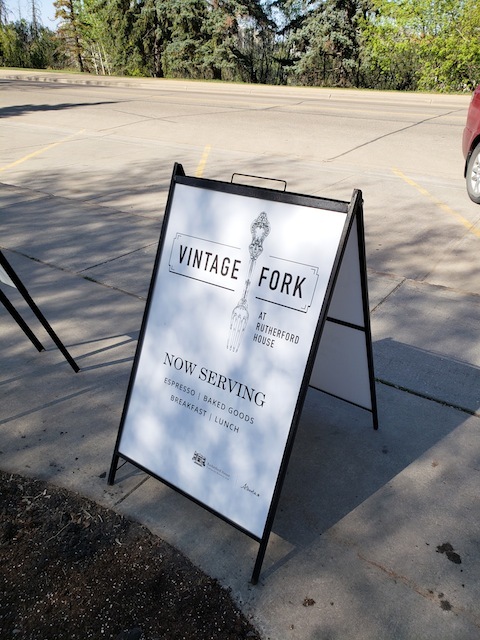 So imagine my excitement when I found out that the restaurant had reopened late last year with a new name — Vintage Fork. 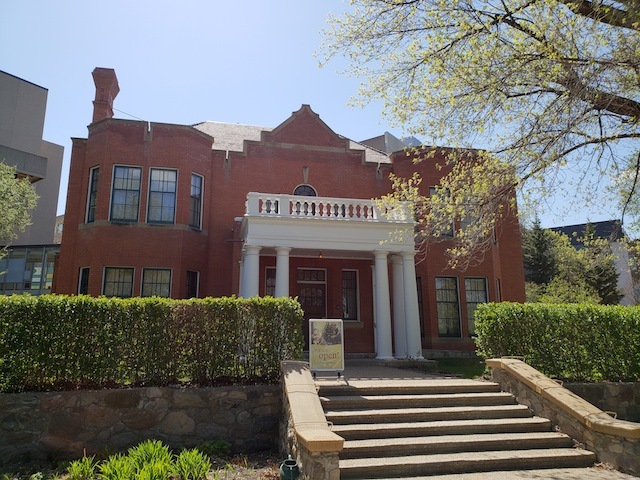 It's definitely a fitting name for this hundred-year-old historic house that was the home of Alberta's first premier, Alexander Cameron Rutherford. The house is also a mini museum with a gift shop in the basement. 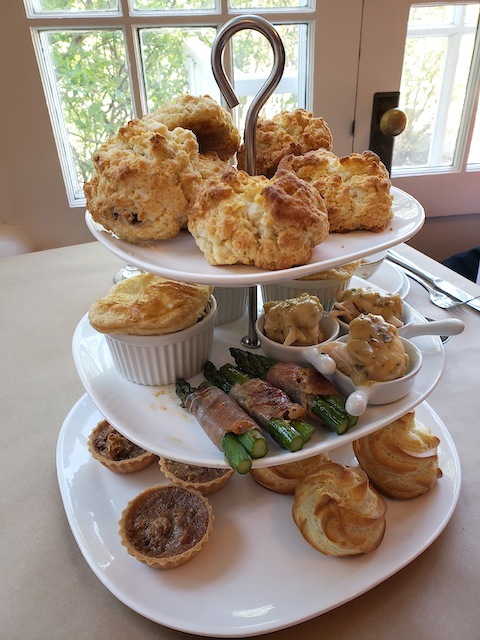 Afternoon tea is available every Saturday and Sunday at 3 pm for $35/person. Reservations are required. 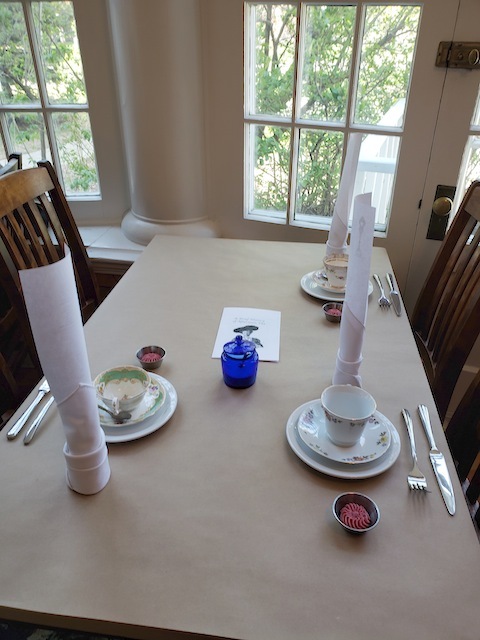 I personally think it's a very reasonable price compared to other afternoon tea venues, especially considering the special setting inside a historic house and the quality of the food. The place was just as I remembered it with a cozy and intimate ambiance and a lot of rustic charm. Seating was a bit cramped but not a major issue. 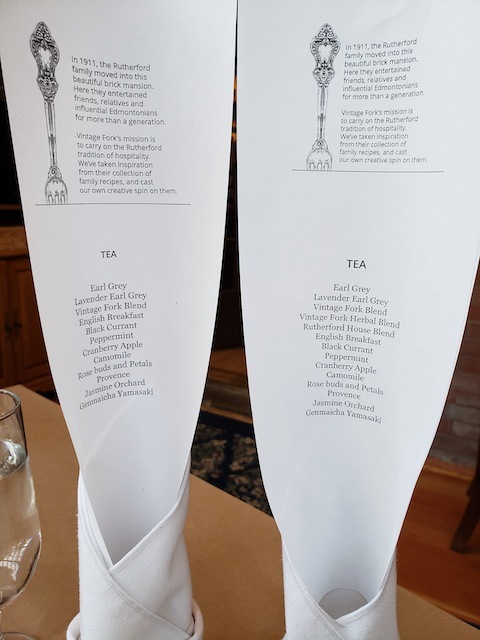 We were each given a tea menu, but there was a discrepancy as the menu on the right below contains two extra options: Vintage Fork Herbal Blend and Rutherford House Blend. One of us ordered the Rutherford House Blend, so I believe the menu on the right is accurate. I ordered the Vintage Fork Blend thinking it would be a house blended black tea, but what I received tasted only of chamomile and nothing else. I'm not sure if they gave me the Vintage Fork Herbal blend by mistake or if it actually tasted like that, but it was definitely not what I was expecting. I asked the server about it and he immediately offered to replace my tea. I ended up getting earl grey and thoroughly enjoyed it. Super happy with the service! We all had teacups with different patterns. 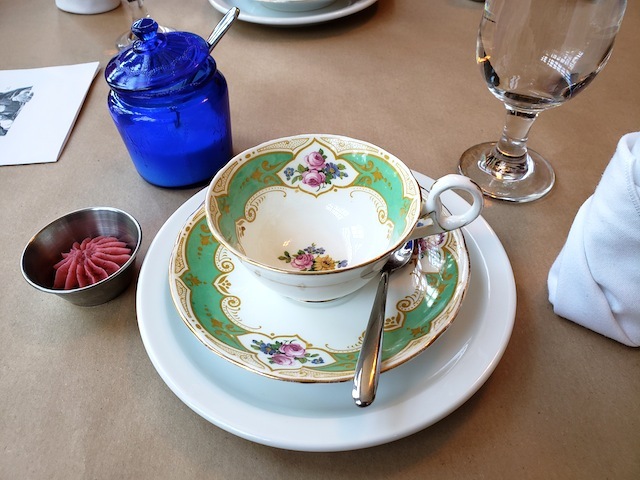 Our server told us that most of the china they use is antique, so some cups may have tea stains despite being clean. Part of the charm of this quaint little restaurant if you ask me. Below are a couple shots of the tower of treats. 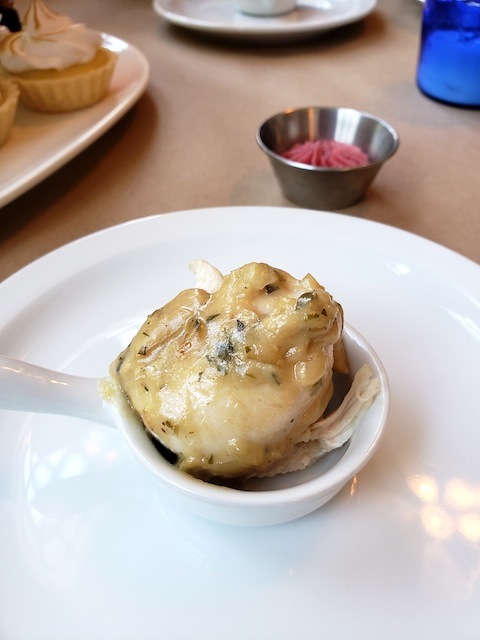 There will be slight variations every week as the chef rotates between the items in his repertoire. 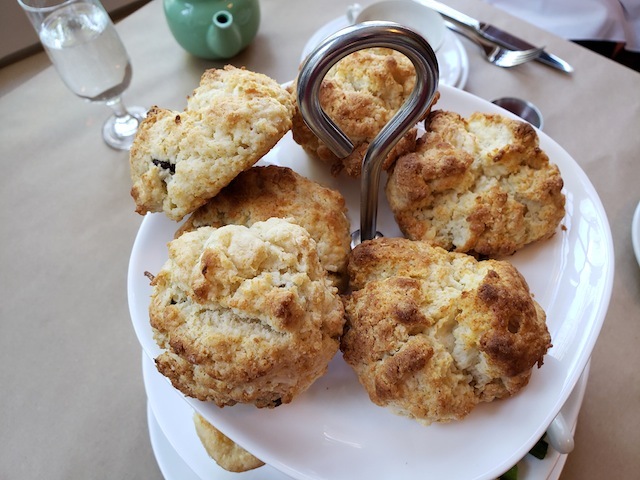 The scones were not the same as the ones from 5 years ago, but they were equally good. 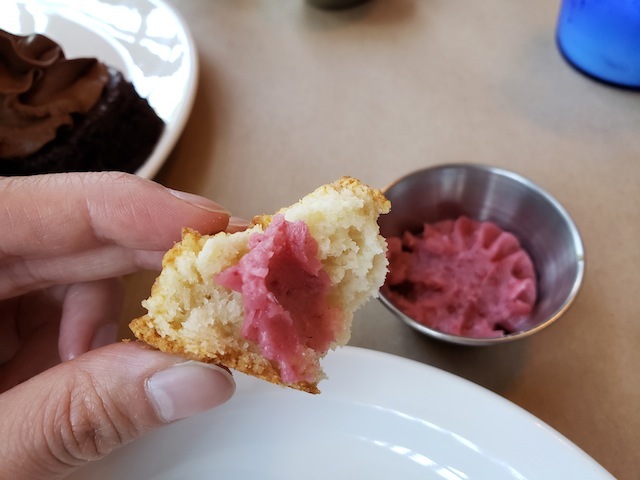 Light and buttery with a moist, tender crumb, they went really well with the whipped raspberry butter made using the original Rutherford family's recipe! I don't usually eat butter with my scones, but I finished my entire serving this time. 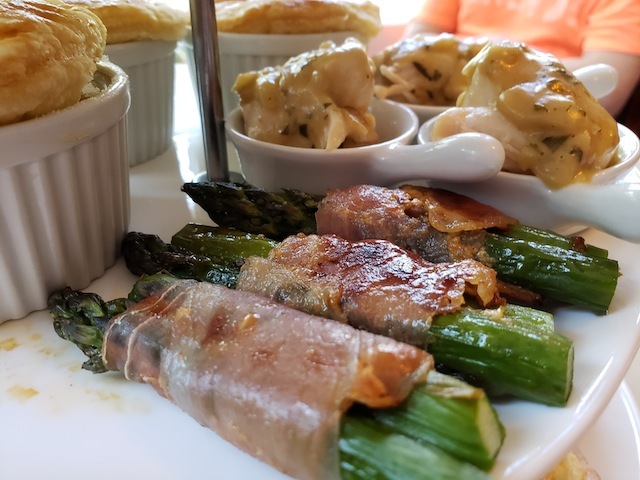 Don't have much to say about the prosciutto wrapped asparagus because it's hard to go wrong with prosciutto, especially when combined with sun-dried tomatoes and goat cheese. 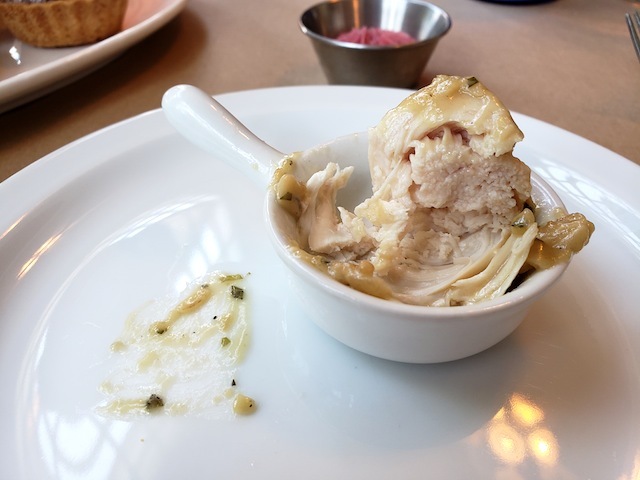 The amaretto chicken was basically a boneless piece of chicken with sliced almonds. I was surprised at how tender the meat was, and the delicate flavour of the sauce was just perfect. 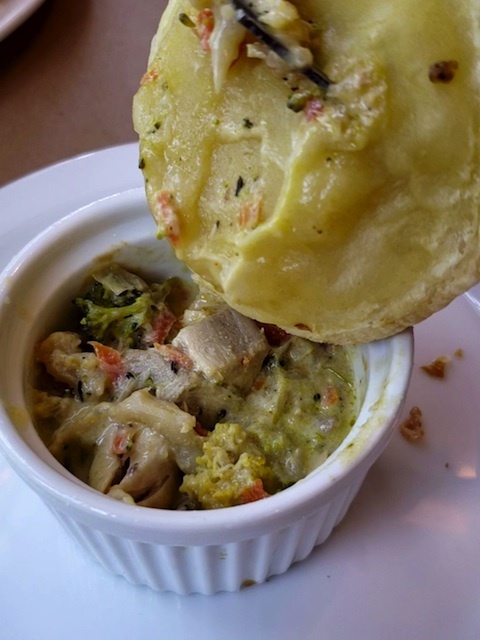 The chicken pot pie was served piping hot and we had to wait a while before we could dig in. 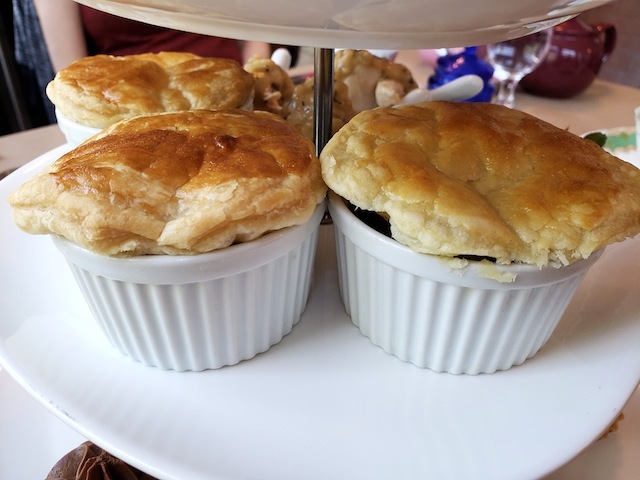 The puff pastry on top was soft with flaky layers, and the filling was a delicious and comforting stew of chicken and veggies. I absolutely loved all of the desserts. My mom does not have a sweet tooth at all and she usually doesn't eat her share of desserts at afternoon tea, but she did this time. I think part of the reason we enjoyed the desserts so much was that none of them were overly sweet. The chocolate mousse cake looked like it might be very dense and sweet like a brownie, but it was actually a very soft and airy cake with a rich dark chocolate flavour, topped with a whipped mousse that was light like meringue with just a hint of sweetness. Butter tarts are also known for being sweet, but these ones were almost savoury with a taste that reminded me of butterscotch or salted caramel. Wish I could buy the butter tarts to take home as they were my favourite! I thought the choux was quite good, despite my disinterest in creampuffs. 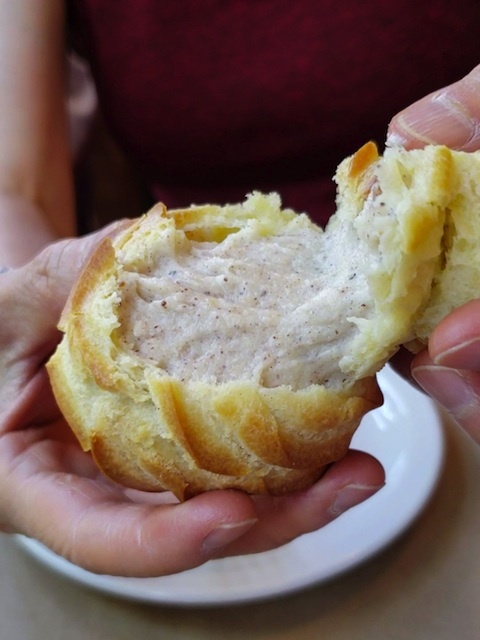 The filling was creamy with just a bit of grain, and the hazelnut flavour was not overly strong. In fact, I thought it was more like a taro cream when I first tasted it, until the hazelnut hit me halfway through. 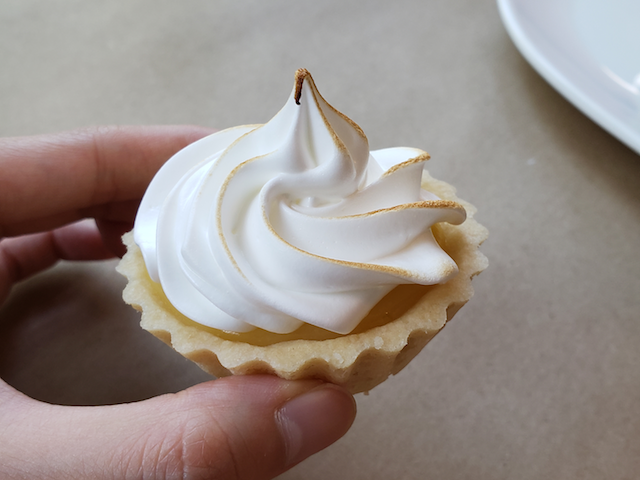 The lemon meringue tart was also perfectly executed with a crisp butter crust, a well-balanced lemon curd, and a dollop of lightly toasted meringue. A simple dessert done well. If you are not interested in a full lunch, you can also drop by anytime during open hours for coffee and baked goods. I cannot say enough good things about Vintage Fork. 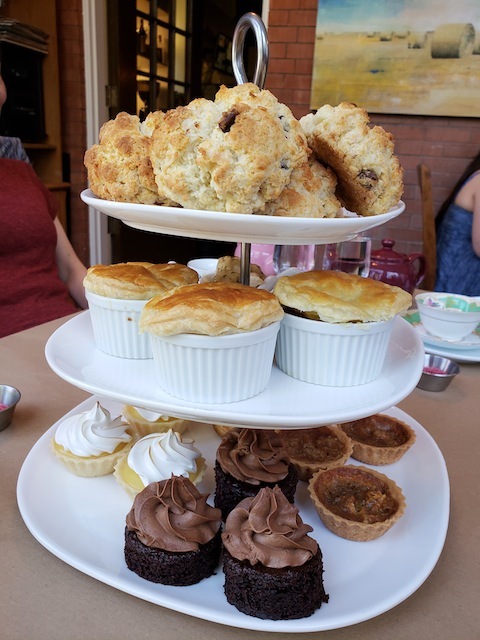 It's rare when all of the food is at least a solid 8/10, and with excellent service and such a lovely quaint tearoom setting, this place is definitely my current favourite afternoon tea venue in Edmonton. I've been asked how it compares to afternoon tea at the Fairmont, but I don't think it's a fair comparison. If you're looking for fancy ingredients like lobster and caviar and a luxurious hotel setting, then Fairmont would be your choice. 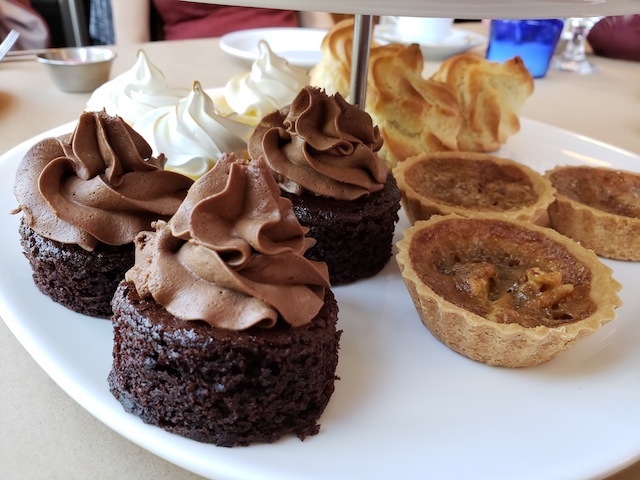 But with a $20 price difference (Fairmont's current price is $55 for weekend tea) and taking into account that Fairmont uses teabags and is not that strong in the dessert department, I know that Vintage Fork will be my go-to for most occasions.